A low mat-forming plant of wet lime-rich mountainous areas. Differs from Marsh Saxifrage in having much smaller flowers (only 5-10mm rather than 25mm) and in having more flowers on each stem. 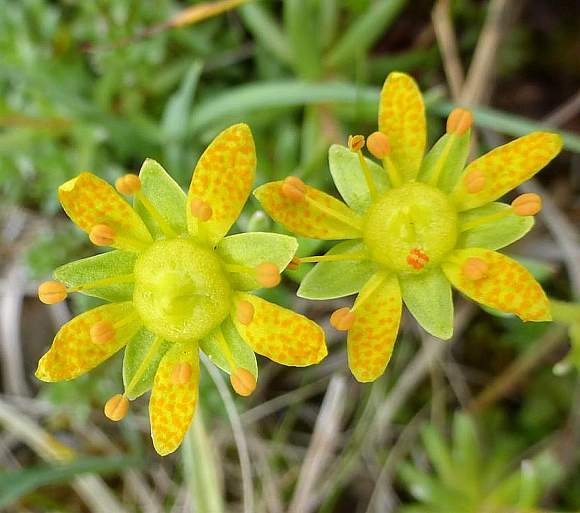 Like Marsh Saxifrage , the petals are covered in small orange dots. The fruit has two tapering projections (centre right). 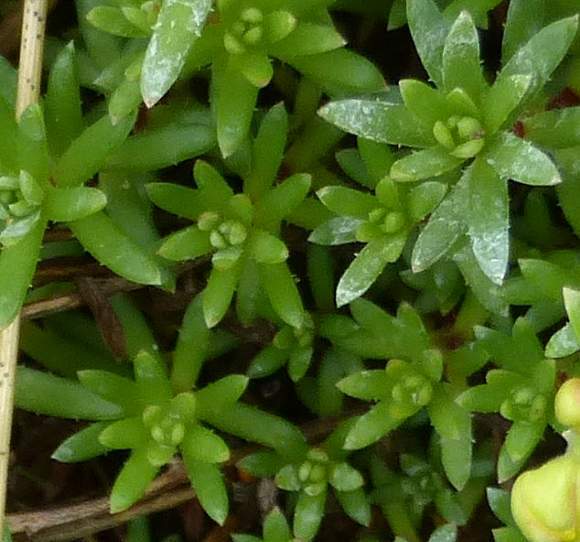 Marsh Saxifrage has red hairs on the stalks which Yellow Saxifrage lacks, it is just sparsely hairy. The rosette of leaves. There are also toothed and narrow stem leaves (not shown). Petals usually 5 in number, but like most saxifrages, it exhibits a varying valency. Some flowers here have 6 petals. The petals are 5 to 10mm long, often with many small orange spots on each, the orange being concolorous with the (usually 10) orange anthers on long yellow filaments. The sepals behind number 5 and are a pale yellow-green. Basal leaves linear and slightly toothed. Easily mis-identified as : Marsh Saxifrage (Saxifraga hirculus) which also grows on mountains, but that prefers an acidic environment rather than limey. 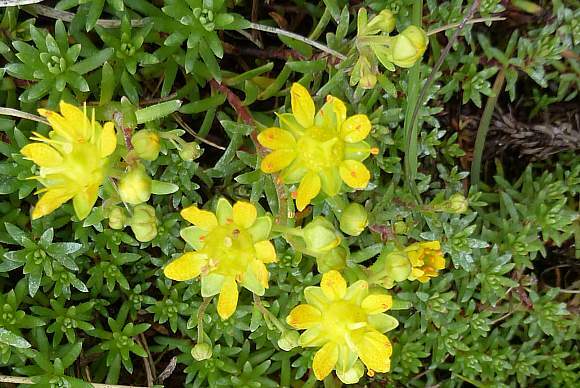 Yellow Saxifrage is far more common than is Marsh Saxifrage . Some similarities to : Caucasian Saxifrage (Saxifraga cymbalaria) which is also yellow, but lacks the orange anthers and is an introduced alien, growing as weeds in gardens. Inhabits wet or moist lime-rich places on mountains. This is much more common than the other yellow-flowered mountainous saxifrage Marsh Saxifrage (Saxifraga hirculus) which inhabits marshy grassland on moors. Some similarities but no relationship to : some yellow-flowerd Stonecrops such as Reflexed Stonecrop (Sedum ), Rock Stonecrop (Sedum forsterianum) and to a lesser extent Biting Stonecrop (Sedum acre) but these are succulents with many flowers on a stalk.